Edmonton Scottish SC were 2016 Challenge Trophy champions at the Sport Chek National Championships in St. John's, Newfoundland Labrador. They won 1:0 over Royal-Sélect Beauport, with 31-year old Steven Wheeler scoring the 93rd minute winner at King George V Park. Canada's national championship was inaugurated in 1913. Edmonton Scottish SC were three times runners up before winning the trophy for the first time on 10 October 2016. 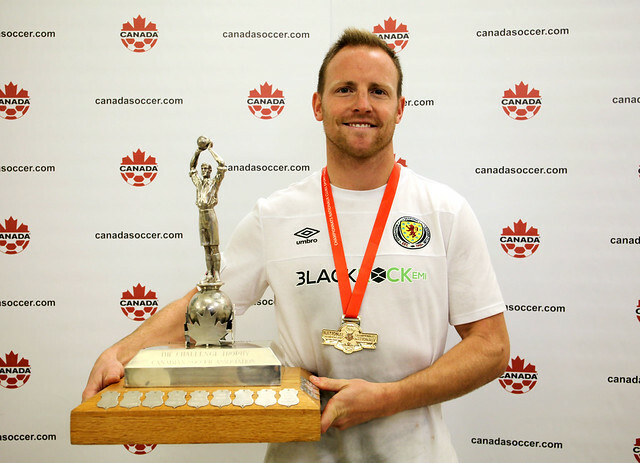 Scottish SC are the second Edmonton team to win the trophy, following in the footsteps of two-time winners Edmonton Ital Canadians SC (1994 and 1997). At the Challenge Trophy finals in St. John's, Edmonton's team featured Karim Broodhagen, James Carr, Almir Gazic, Nicolas Gonzalez (injured), Paul Hamilton, Marcus Johnstone, Richard Klein, Chris Kooy, Christian Koosmin, Sam Lam, Chris Lemire, Dexter MacLachlan, Michael McCormick, John Pegg, Nicky Reyes, Dave Rutledge, Anoop Sahota, Jay Vetsch, Steven Wheeler, and Francisco Wong. Team staff were coach Kevin Poissant, Miles Hunt, Cathy Vetsch, and James Black. "We’ve got a solid core that goes back to 2009, so we have been building towards this point," said coach Kevin Poissant, whose team finished unbeaten in 2016. "Quite frankly I don’t think we could be as competitive as we are without the Alberta Major Soccer League, I think it’s the best amateur league in Canada and the quality of competition we get every single week helps us in places like this." After the on-field celebrations, all 20 players took their turn posing for a picture with the national trophy.